Cross-country skiing burns a ton of calories, it is low-impact, it is so good for you and it is FUN! And Nordic Ski Walking is the next best thing. 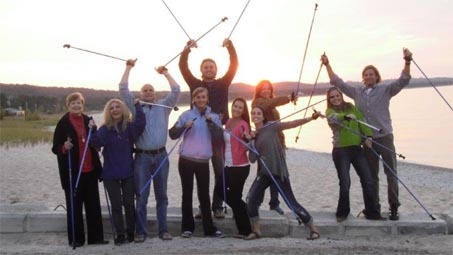 Nordic Walking (Ski Walking) is a great way to get ready for your next ski trip. Nordic Walking is basically hiking and trekking with special poles. Nordic Walking Poles can help to turbo charge your walking campaign. Over 10 million Europeans are Nordic Walking everyday- in the cities (with special removable rubber Nordic Walking tips/paws for pavement), out in the country and up in the mountains. Don't get scammed by cheap/flimsy 2-piece or 3-piece walking poles. Skiers use one-piece poles custom fit to their individual's heights. At WWW.SKIWALKING.COM we have 32 different lengths - an industry 1st. Our durable poles from SWIX of Norway are ideal for athletes and are also the #1 poles for physical therapy. One-piece poles are ideal for seniors and anyone with balance issues. Perfect length poles help us to automatically walk with a super straight back - better walking posture is biomechanically a good thing. This improved walking posture when combined with the unique 4-Wheel-Drive type action of walking correctly with poles radically reduces the stress to the shins, knees, hips and back. All ages and ALL fitness levels can now unlock the calorie burning and aerobic benefits of NORDIC WALKING (SKI WALKING). Walking with poles burns up to 40% more calories than regular walking. Find out more about NORDIC Ski WALKING and how to get started contact WWW.SKIWALKING.COM and the American Nordic Walking System - a member of the Great Lakes Winter Trails Council.